Our factory specializes in producing aluminum mechanical equipment, the biggest production base for auxiliary equipment of section aluminum in East China. We gain good evaluation of users because of advanced technology, perfect quality, after-sale service. Our product including: run out table product including: run out table product line, aluminum hauling machine, Quick Heating Furnace Single stick hot-cutting furnace, aluminium timing furnace, hydraulic pressure sawing machine, aluminium stick heating furnace, aluminium packing machine,stick membrane machine, aluminium bar foundty equipment and so on. We can offer pant designing for raising your benefit. 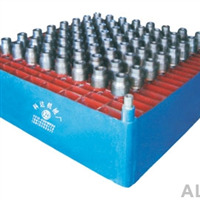 This equipment is mainly used to pack such products as stainless steel, plastic-clad steel and aluminum alloy sections. Its major features include the thermal shrinkage treatment to the plastic film on the surface of the products, which can protect and ensure the pleasing form of products.